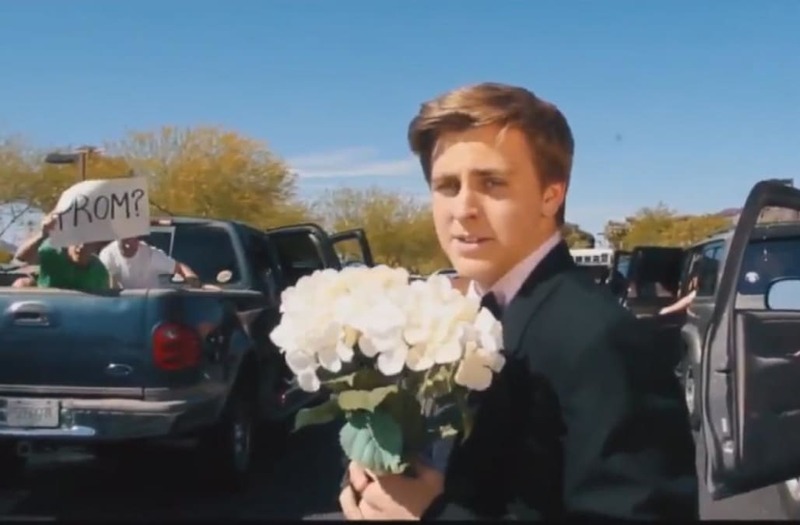 An adorable promposal went viral after an Arizona high school student recreated the opening scene from the Oscar-winning film La La Land to invite the film's star to the big event. The grand effort was all so Jacob Staudenmaier could ask Emma Stone, who took home the Best Actress Academy Award for her role in the musical, to his prom. To make the video, Staudenmaier first tried to replicate the Los Angeles freeway gridlock from the film's first sequence in the parking lot of his school, Arcadia High School in Scottsdale. "I saw La La Land and it was one of my favorite films of the year," he told Inside Edition. "When I found out that Emma Stone was from Arizona, I felt that it would hold more relevance to her and to me." It should also be known that Staudenmaier resembles Stone's La La Landco-star, Ryan Gosling, and even sings like him. Actor Emma Stone attends the 89th Annual Academy Awards at Hollywood & Highland Center on February 26, 2017 in Hollywood, California. 89th Academy Awards - Oscars Red Carpet Arrivals - Hollywood, California, U.S. - 26/02/17 - Emma Stone. 89th Academy Awards - Oscars Awards Show - Hollywood, California, U.S. - 26/02/17 - Actress Emma Stone. Nominee for Best Actress 'La La Land' Emma Stone arrives on the red carpet for the 89th Oscars on February 26, 2017 in Hollywood, California. Read: Best Picture Flub Hands 'Moonlight' Oscar to 'La La Land' But Who's to Blame? He got his fellow classmates to help out with the video as extras and film crew. "Without everyone's help I wouldn't have been able to do it," he said. The high school senior, who hopes to one day become a filmmaker, has not yet heard from Stone.